No payment will be requested using this form. Its sole purpose is to track your order and calculate the shipping charges. 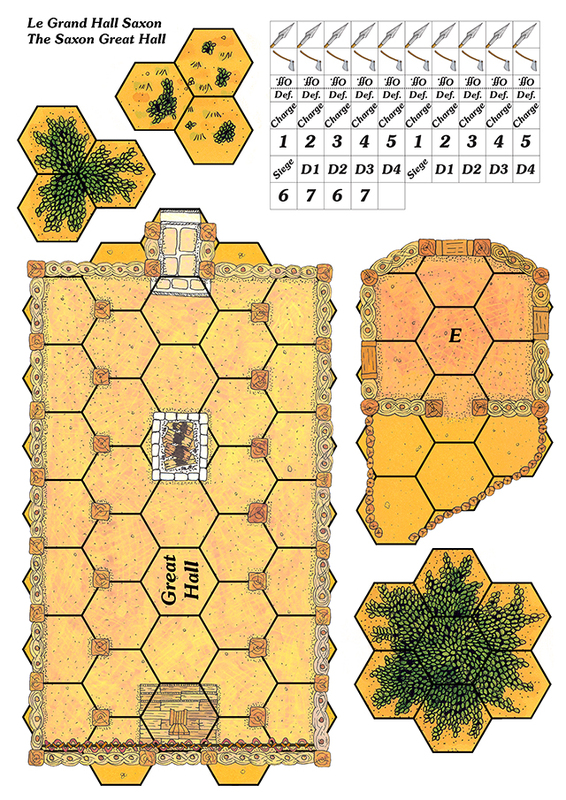 (4) sheets including 56 different characters in various stances, 300 DPI, printed both sides on very thick cardboard and precut. .
Map using the standard Cry Havoc format, 300 DPI, printed on a light, coated cardboard similar to the original ones. A4 sheet, 300 DPI, printed on a light, coated cardboard similar to the original ones. 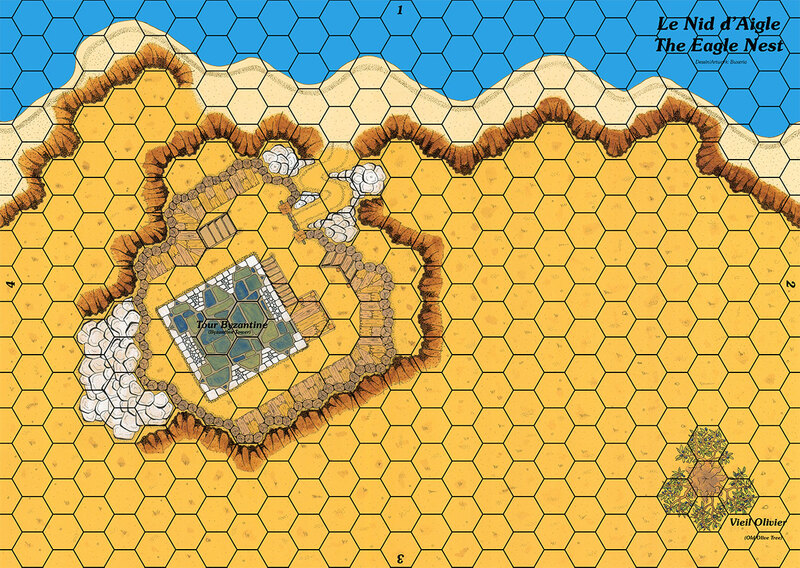 A3 map printed on a light, coated cardboard; 300 DPI. 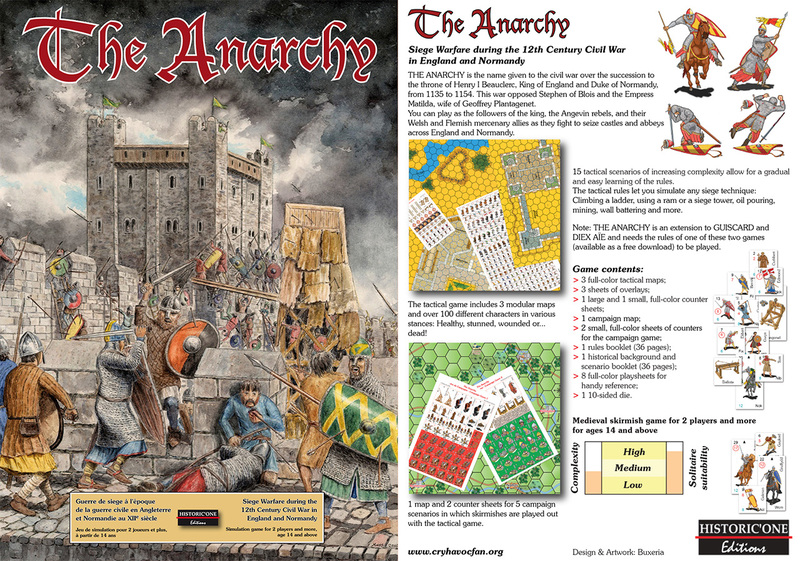 36-page rules booklet in English in full color for The Anarchy. Needed to play the siege rules. 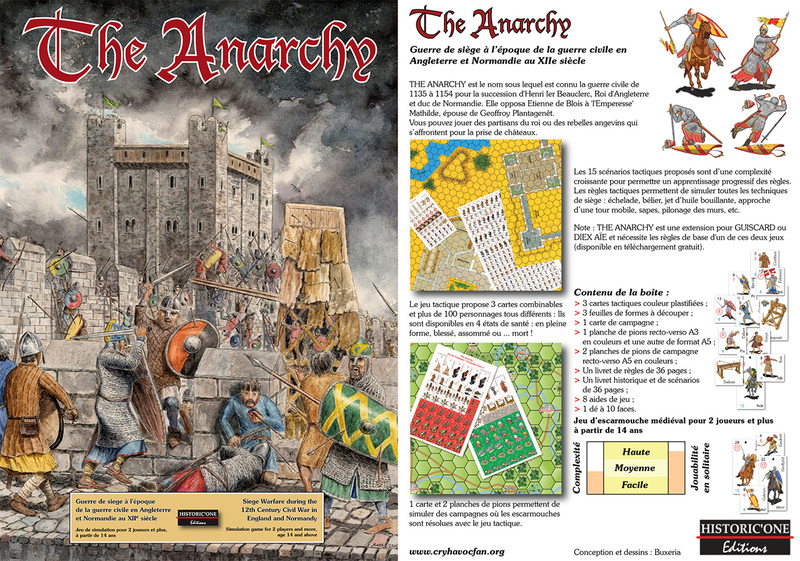 36-page rules booklet in French in full color for The Anarchy. Needed to play the siege rules. 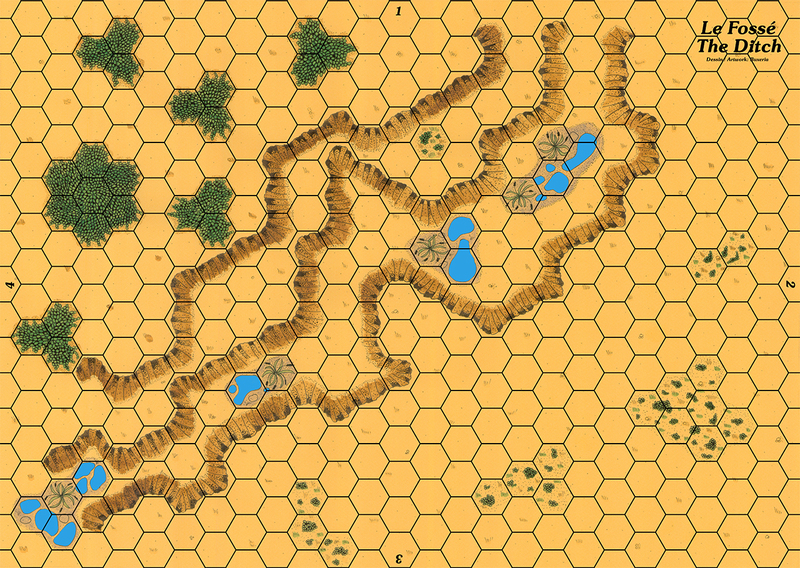 Maps using the standard Cry Havoc format, 300 DPI, printed on a light, coated cardboard similar to the original ones. Pack of 2 counter trays (origin GMT) cut to fit into a standard box. 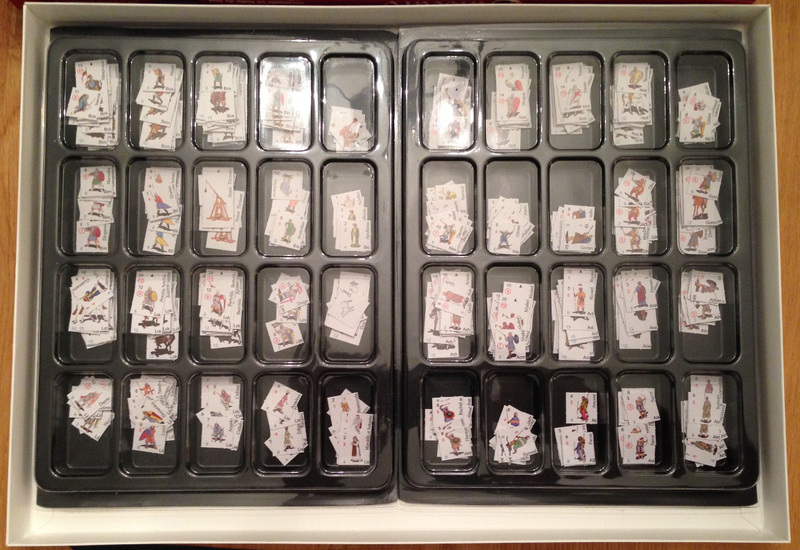 The trays will be included in the box set when ordered together. (3) sheets including 56 different characters in various stances, 300 DPI, printed both sides on very thick cardboard and precut. .
A3-size sheet including 105 different characters in various stances, 300 DPI, printed both sides on thick cardboard and precut. 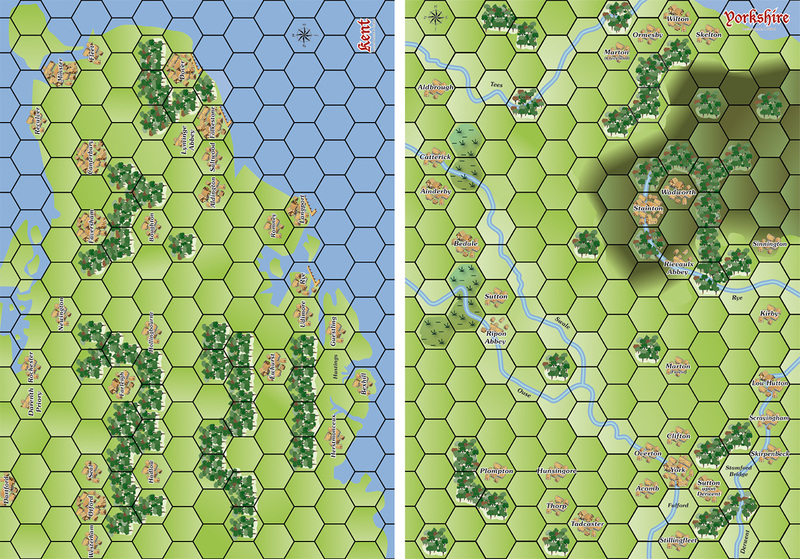 A5-size sheet including 30 Norman, Saxon, Scot and Viking combat groups for the campaign game as well as additional tactical counters, 300 DPI, printed both sides on thick cardboard and precut. Map printed on both sides on a light, coated cardboard; 300 DPI. 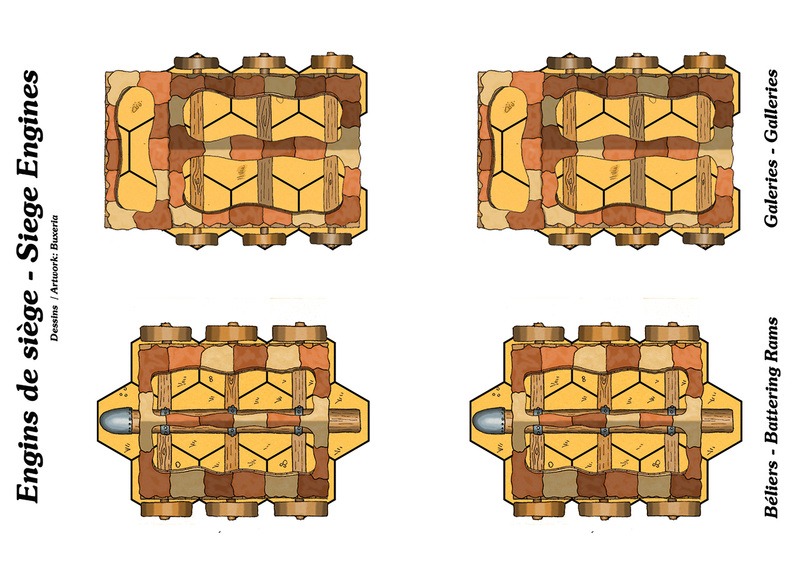 40-page rules booklet in English in full color for Diex Aïe. Needed as well to play The Anarchy. 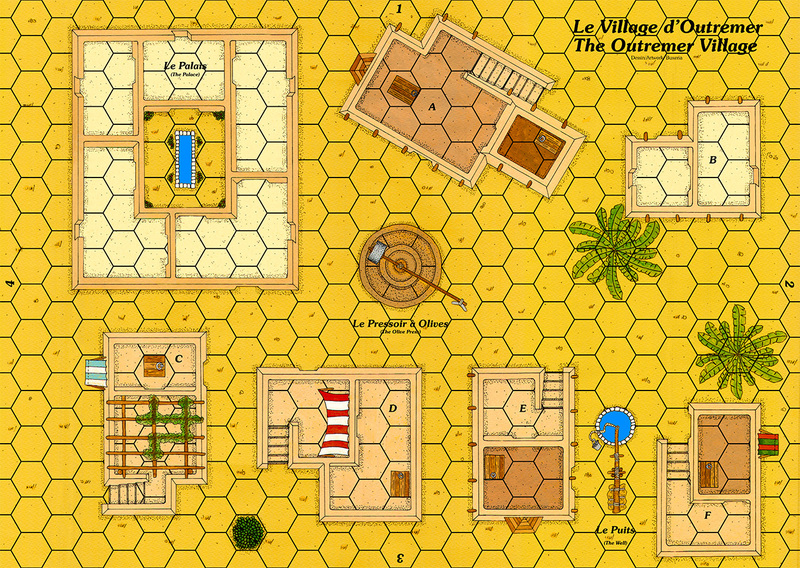 40-page rules booklet in French in full color for Diex Aïe. Needed as well to play The Anarchy. 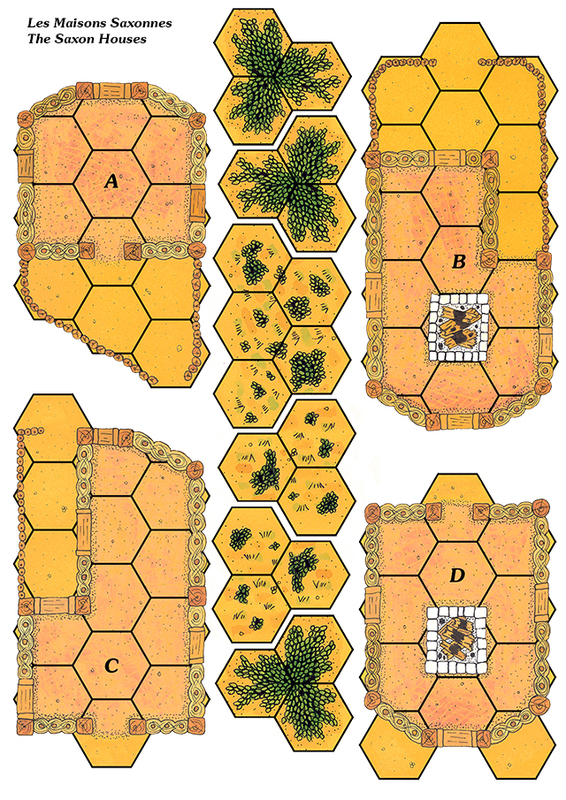 Pack of 4 junction maps using the standard Cry Havoc format, 300 DPI, printed on a light, coated cardboard similar to the original ones. printed on a light, coated cardboard similar to the original ones. 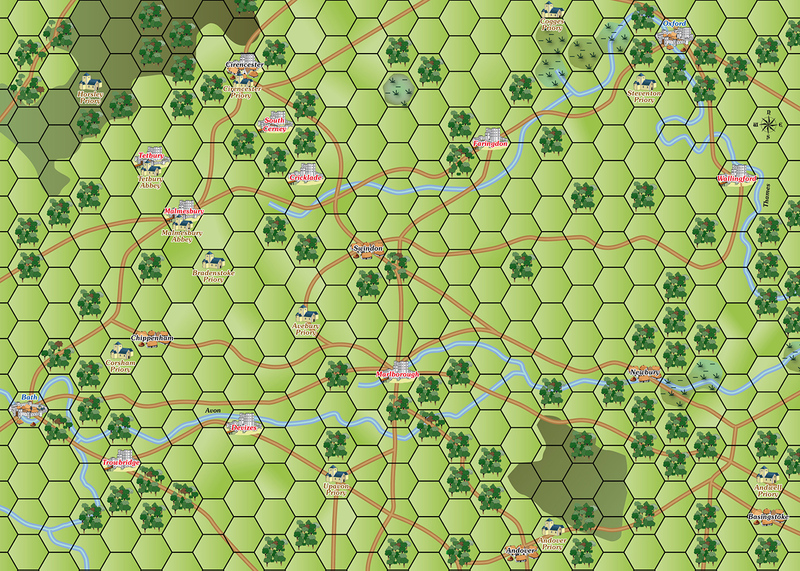 A5-size sheet including 21 different counters with Earls, Nobles, Thanes, Huscarls, Sergeants and Coerls, 300 DPI, printed both sides on thick cardboard and precut. 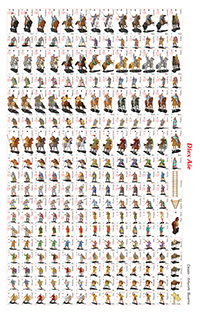 A5-size sheet including 28 different counters with milicians, bowmen, peasants and accessories, 300 DPI, printed both sides on thick cardboard and precut. 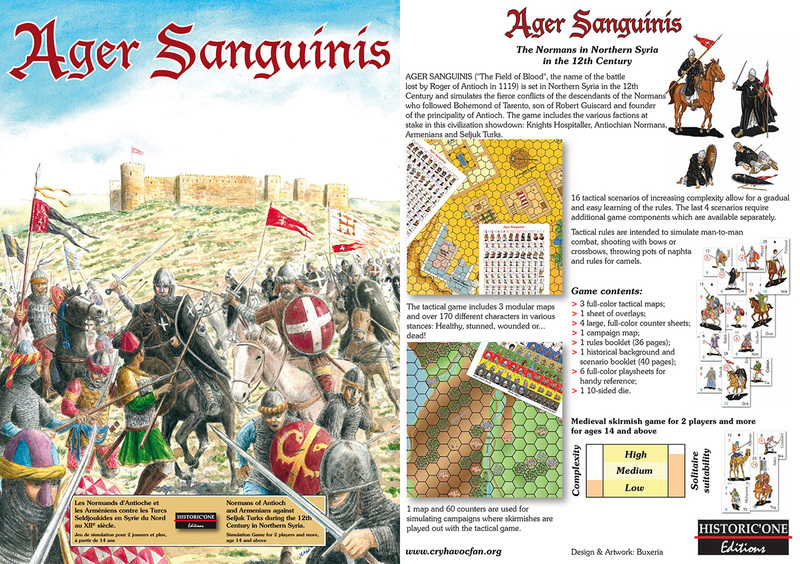 A5-size sheet including 38 different counters with civilians, animals and walls, 300 DPI, printed both sides on thick cardboard and precut. 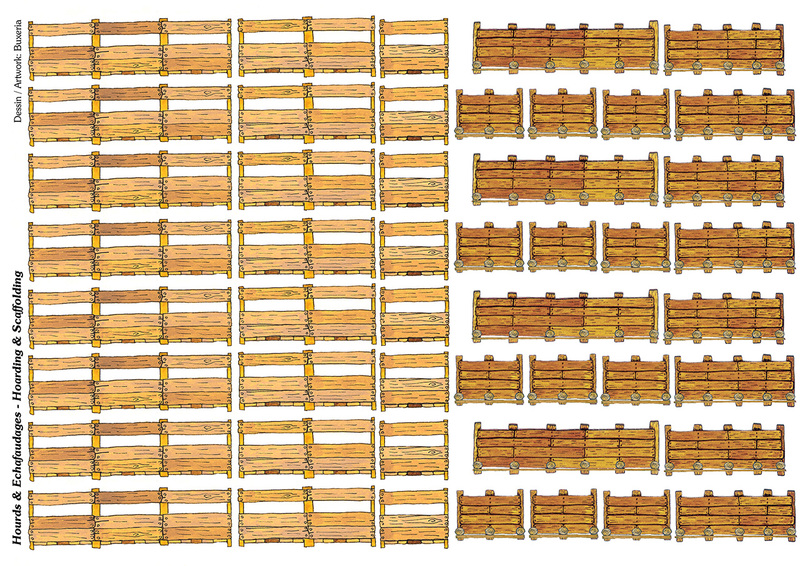 A5-size sheet including 26 different counters with jarls, bersekers, bowmen and hirdmen, 300 DPI, printed both sides on thick cardboard and precut. 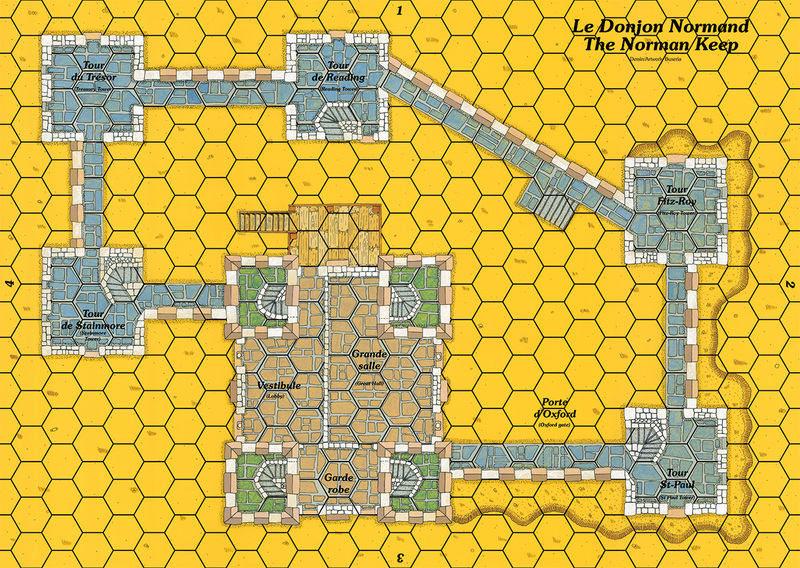 A5-size sheet including 33 different counters with bondis and accessories, 300 DPI, printed both sides on thick cardboard and precut. 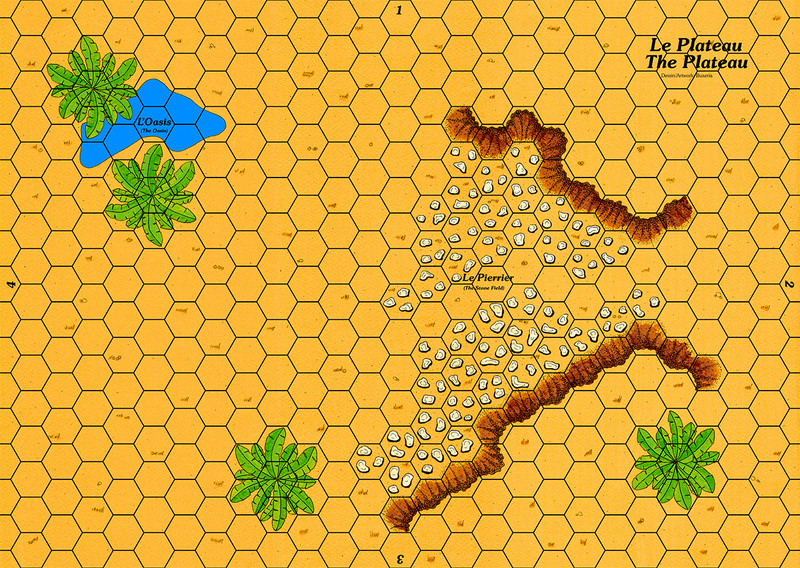 A5-size sheet including 30 different counters with knights, pavese crossbowmen, macemen, mantlets amd wooden defenses, 300 DPI, printed both sides on thick cardboard and precut. 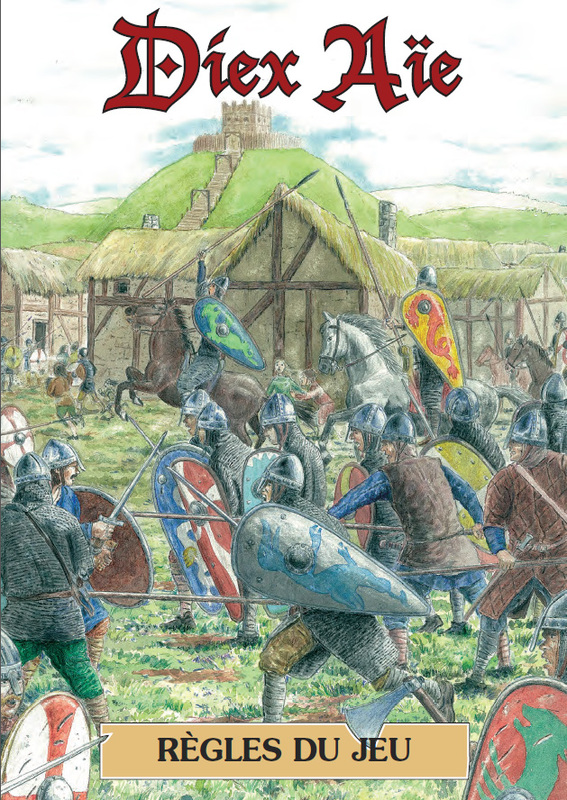 A5-size sheet including 38 different counters with knights, billmen, sergeants, pikemen and wooden defenses, 300 DPI, printed both sides on thick cardboard and precut. 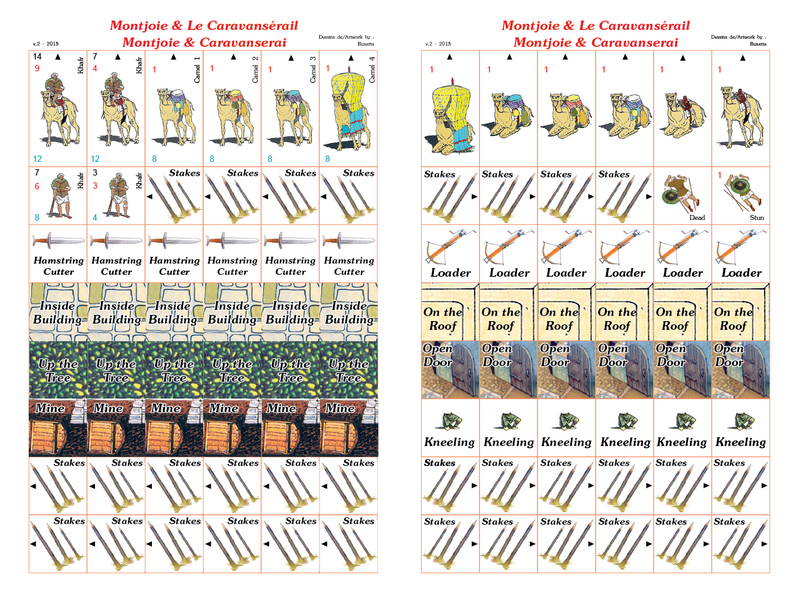 A5-size sheet including 69 different counters with camels and various markers for the Montjoie and Caravanserai extensions, 300 DPI, printed both sides on thick cardboard and precut..
coated cardboard similar to the original ones. 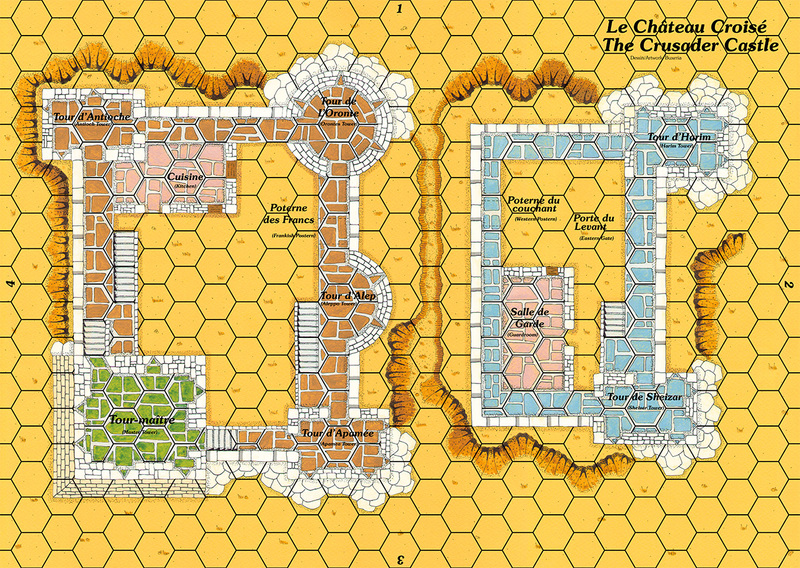 Mini-map using the standard Cry Havoc format, 300 DPI, printed on a light, coated cardboard similar to the original ones. A4 page using the standard Cry Havoc format, 300 DPI, printed on a light, coated cardboard similar to the original ones. 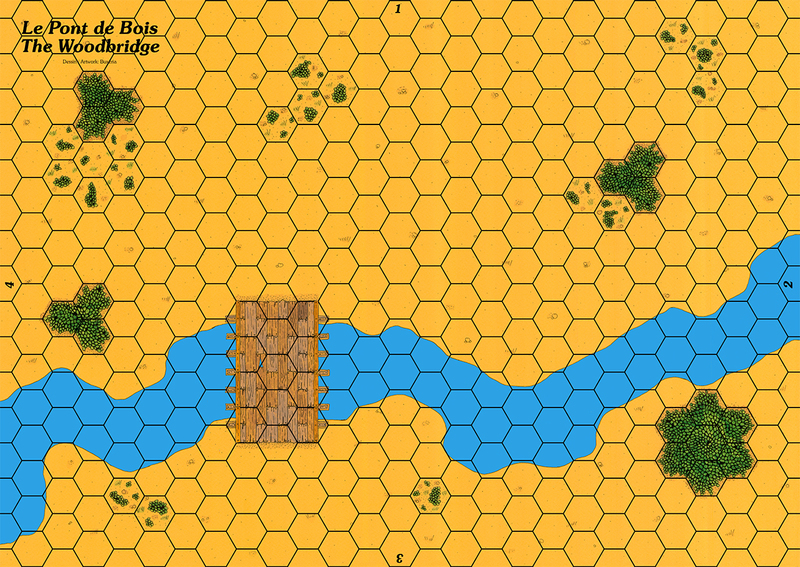 Note: to reduce printing costs, the siege tower has been grouped with the walls and scaffoldings. Original set of 3 booklets (Rules, History and Scenarios) plus a quick reference sheet in Spanish coming from the unsold inventory of Duccio Vitale, the designer of the French adaptation of the Cry Havoc game series.